This is the first red velvet cake recipe I'm sharing on my blog, and although I do like red velvet, I suppose it's not a distinctive flavor in my opinion or one that I crave, unlike rich dark chocolate cake. And red velvet cannot in any way be considered chocolate, with such an inconsequential amount of cocoa powder added to the batter. 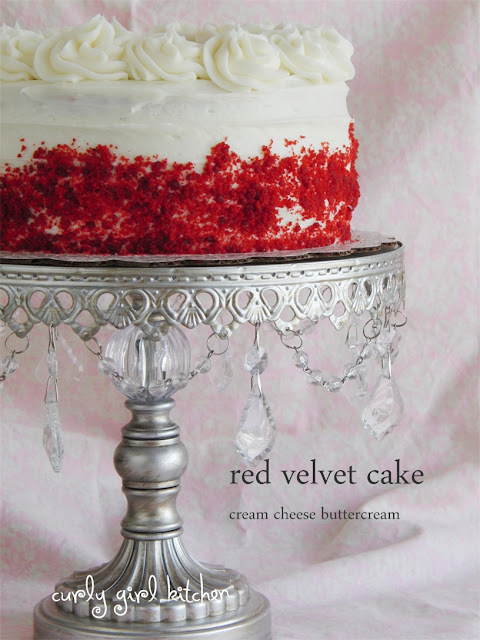 Red velvet is, essentially, simply a very moist buttermilk cake with a beautiful, signature red color and a nice tang from the buttermilk. Before there was food coloring, the red color was actually achieved by the combination of the buttermilk, vinegar and cocoa powder, with an acidic reaction between the buttermilk and vinegar bringing out the natural red hues in the cocoa powder. With that chemical reaction alone, I'm not sure just how vibrant the resulting red color would be, so I did add a good dose of food coloring to ensure dramatically red results. I baked this cake for a birthday party, and as it was for a man's birthday, I kept the decorating simple, clean and classic, with no girly ruffles or polka dots, tempting as it would be on such a pretty cake. I've heard back that he loves his cake so much, he's been standing in the kitchen, eating it straight from the box for breakfast. Baker's Note: I have experimented with swapping out some of the oil for more buttermilk (1 cup oil with 1 1/2 cups plus 2 tablespoons buttermilk), which works just as well, if you don't want to use quite that much oil. Preheat the oven to 350. Spray the bottoms only of three 8-inch cake pans with non-stick spray, line the bottoms with parchment paper, and spray the paper also. In a large bowl, whisk together the flour, sugar, cocoa powder, salt, and baking soda. In a separate bowl, whisk together the eggs, oil, buttermilk, vinegar, vanilla and red food coloring. Add the wet ingredients to the dry and whisk vigorously for several minutes until smooth and well blended. Divide batter between the pans. Bake on the middle rack for 25-28 minutes, until the centers spring back when lightly touched and a toothpick comes out clean. Set on wire racks, cover loosely with a clean kitchen towel and cool completely. Remove the cakes from the pans and discard the parchment paper; level the tops of the cakes, reserving the cake scraps. Place one layer of cake on a serving plate or cake pedestal. Frost with a thin layer of buttercream. 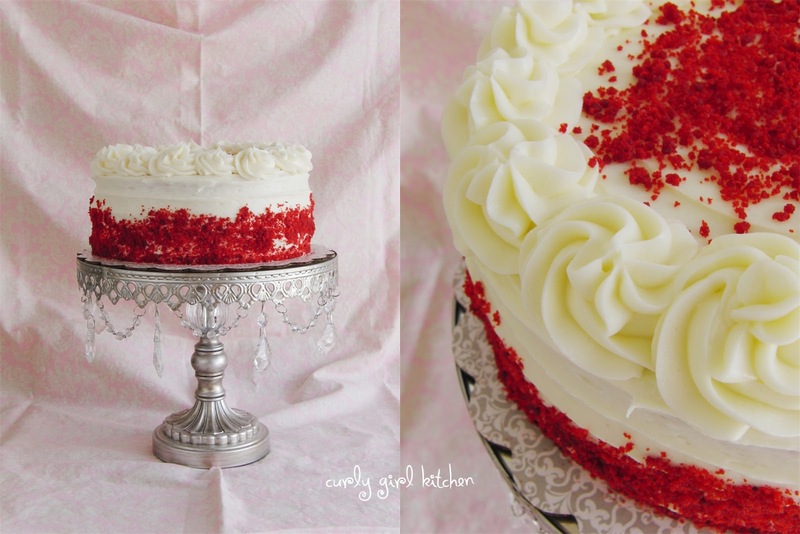 Repeat with the other layers of cake, then frost the cake all over with a thin "crumb coat" of buttercream. Refrigerate for 15 minutes to set the crumb coat, then frost all over with a final coat of buttercream, reserving some of the buttercream for piping swirls on top. Take the cake scraps from leveling the cake and break them up into fine crumbs, either with a fork or in the food processor. Press the crumbs around the sides of the cake. Pipe swirls of buttercream on top of the cake to finish, and sprinkle a few more crumbs on top.